Today for a special edition of CNN’s State of the Union with Candy Crowley: Yielding their Time, retiring Senators Jon Kyl, Kay Bailey Hutchison, Joe Lieberman and Rep. Barney Frank reflect on their careers, their accomplishments, and their disappointments; plus, they offer advice to members of the 113th Congress. A full transcript of the interview is after the jump. SEN: JOE LIEBERMAN (I) CT: Well, what strikes me is that we’re actually $16 trillion in debt. I mean we — we’ve built up this incredible debt, uh, over a period of years. I never would have guessed that we’d be in this position when –when we started out. CROWLEY: But you guys are all guilty of that. JOE LIEBERMAN: Well, not only — we — we’re all — we’re all guilty. We’re all part of how it got here and a couple of (INAUDIBLE) contributed to. Um, so, uh, am I surprised that we’re facing this fiscal cliff now? No, because, you know, we put it in. Uh, we created this cliff, because we thought it would be so terrifying that Congress would actually be shaken to reach a bipartisan agreement to reduce the debt. And, uh, that’s what our responsibility is in the — the time between now and the end of this year. SEN. KAY BAILEY HUTCHISON (R), TEXAS: I think Congress is reflecting the nation. I think we are very divided, not in the goal, but in how we get there. And I think America is, too. And I think that is reflected in — I do believe that after this election, we now know am — Americans expect us to go forward. And we have no choice but to go forward. REP. BARNEY FRANK (D), MASSACHUSETTS: Let me tell you a very important point. One of the things that’s troubled me about the analysis of Congress is, people act as if we’re in a bubble and we just — we’re self-generated. I mean there’s very few people in this government who aren’t here because they didn’t get more votes than anybody else in the last election. And so you said the public doesn’t like the result, they should be doing a little self-criticism. At any given time, America is governed by the results of three elections. That’s our “Constitution.” There were 72 elected in 2006 who are here. There’s a president elected in 2008. Then the House of Representatives predominantly in 2010. And (INAUDIBLE) the pulse — there have been very few cases in American history where the public changed its mind so drastically between 2008 and 2010. So they put one group in power here and another group in power there. And there are legitimate differences. I — I hate it when people say we’re bickering. We’re debating the most fundamental issues. Now, we still have to make an effort to overcome it. But where it came from was the American “Constitution” and the fact that there was, on the part of the voters, a very drastic swing in their opinion in that two year period. JON KYL: And I want to agree with Barney on an important point here. There’s nothing wrong with robust debate among different philosophical positions. In fact, if you look at our jury system, the whole idea is there you have a big, um, contest between two sides. And supposedly, truth wins out in the end. It’s the same thing with the debate in the House and the Senate. You have this robust contest between the liberal and the conservative idea. And eventually, something either wins out or some compromise pertains. So the notion that we should just compromise for the sake of compromising isn’t necessarily the right result. And it all will, there is usually a way. And sometimes the pressures are so great that you absolutely have to. But I’ll just close with this. I suspect that none of us, at the time that we are coming to a close of our careers, pretty long careers, in most cases here, um, are happy about the situation in which we find ourselves. CROWLEY: — we’ll get this done. FRANK: Let me — the fact is there is no decision-maker. If there was a decision-maker who was being complacent in the face of this, you should be very critical. But the American “Constitution” and the American people have put people into a shared power situation who’ve had very different views. Now, one thing is different. Maybe I’m being a little positive here, but it does seem to me that in 2010, some people came to the Congress, particularly the House, who said compromise is a bad thing. I hope that, as a result of the last election, there’s going to be less of that and — and every one of us has to be prepared to vote for something we don’t like. JOE LIEBERMAN: Yes, you know, I just — since we’re talking about the “Constitution,” I want to go back briefly to George Washington, who, in his farewell address, warned the future generations of Americans against the danger of political factions to which members of our government would be more loyal than they were to the country. In other words, that they’d serve their factions more than the common interest. FRANK: And I just wish on that point, that everybody would sign a pledge, everybody sign another pledge. FRANK: And I’ve always avoided the pledges. I’ve told people, look, I agree with you 100 percent. I’m going to do everything I can for that. But I can’t tell you, in a given situation, what the trade-offs will be, what the options will be and I’m not signing a pledge. JOE LIEBERMAN: And partisanship is — has gone to — extreme here, but even more is a word that’s come up, the — the unwillingness to compromise. If you approach every issue saying, I will not vote for this unless I get 100 percent of what I want, in the end, you get 0 percent. CROWLEY: Senator, we — 102 years — more than a century’s worth of Capitol Hill experience sitting right here. So I figure you all are pretty good readers of the crystal ball up here. Am I right in reading that you all think we’re not going to go off this fiscal cliff? We will come up with something? HUTCHISON: Yes. I believe we will come up with a way forward. Do I think we’re going to do everything by the end of this year? Probably not. But I think we will not have a fiscal cliff, we will have a plan, hopefully, to go forward. And we will have a blueprint. And we will set the stage for long-term. KYL: — and other ideas in between. What’s harmful is the contest between partisan Republicans and partisan Democrats. And there’s a difference between ideologies and pure politics, because when politics intervenes, it creates gotcha situations, votes that can be used in 30 second commercials by one side or the other, and it results in gridlock. So I think what we need to try to find here is a way to have the debates about policy and get to the point of compromise, when possible, but to do as much as we can to keep partisan politics out of the equation. FRANK: first of all, partisanship, I believe, is very important if it’s done right. You don’t have democracy without parties. That’s never been a — a system. The problem I have — and — and there are legitimate differences that should be debated. The problem is when — when those differences become so embittered, that people can’t then compromise or — or come together. And I — I think partisanship within the parties serve an important part of this. And I want to say this in terms of this — and now I’m going to be a little partisan. I became chairman of the Financial Services Committee in 2007. And I immediately began to work with Hank Paulson, the Republican secretary of the Treasury, and Ben Bernanke, George Bush’s appointment (INAUDIBLE) some Republicans who right now forget that. Um, we did some work with them. And people forget, in the last months of 2007, George Bush went to Nancy Pelosi and Harry Reid and said, I need a — guess what — a stimulus, that terrible word. And Pelosi and Reid worked with him to do that. And then in 2008, they came up. John, you and I worked together on the whole question of the response to the — to the financial crisis. I believe that we had, in 2007 and 2008 — this is not a longstanding problem. A great deal of cooperation with the Bush administration. I do believe that there were elected (INAUDIBLE) 2010, the Tea Party influence, who repudiated the notion of compromise. And some of them said it explicitly. So I — I think partisanship, you’ve got to start from a position of principle and then you work together. And I think in 2007 and 2008, we showed how you could do that. LIEBERMAN: Candy, let me — let me just join in the general hopefulness that we’re going to avoid the fiscal cliff. But it’s not a done deal and it’s not a certainty. And the reason is the country is — the government is on automatic pilot to the fiscal cliff, to massive tax increases and really to the horrible, uh, spending cuts on January 1st unless we act. So if Congress does nothing, which Congress has gotten pretty good at doing these days, uh, we’ll go over the fiscal cliff. So this — there’s work to be done and compromises to be reached. CROWLEY: Let me — let me move you on. We have the Petraeus matter going on. And I think my overarching question here would — while this works itself out and we found out what actually went on, is, is anyone disturbed by someone going to the FBI and saying, gee, I’m getting these really funky e-mails, would you like into it? And the FBI looks — looks into the private e-mails of public people, but looks into the private e-mails. And then it ends up toppling the head of the CIA. KYL: Cyber security is a huge problem. If somebody is hacking into the director of the CIA, you need to know that. General Petraeus was the director of the CIA and there was a question about his mail, his e-mail accounts. The FBI (INAUDIBLE) to look into that and they’re going to try to determine, is something unauthorized happening here? Now, they stumbled upon something totally different. But to your question, no, I don’t feel badly if the FBI is going to make sure the director of the CIA is not being hacked into in an unauthorized way. FRANK: (INAUDIBLE) they — Petraeus, they found it — they stumbled across the Petraeus issue when she complained. There was no mention of Petraeus. I’ve got to say what — what surprises me is that these people are still sending e-mails. LIEBERMAN: That — that goes to judgment. So I — I would say that I’m — I’m talking speculatively here. If — if these e-mails to Ms. Kelley in Florida were really, uh, frightening, it — I’m not concerned that the FBI has the capacity to make a baseline judgment, is this a real problem that might do damage to this woman, and, therefore, we ought to at least do a preliminary investigation? I mean I think that more and more crimes that have been person to person, traditionally, are going to be committed over the Internet. I’m glad the FBI has the ability — the capacity to investigate them. KYL: — breaches of security. There could have been breaches of the director’s private e-mail accounts or public e-mail accounts. FRANK: You — you’re suggesting that something wasn’t legitimate here, is that the trouble? FRANK: — is kind of a weasel word. HUTCHISON: — until two months later? FRANK: I pointed to those kinds of implications, very troubling. I — I — do you distrust the FBI? Is Mueller lying? Who — who are accusing of not having done the right thing? HUTCHISON: I’ve always had great respect for him and great respect for General Petraeus. CROWLEY: Wouldn’t — wouldn’t care. FRANK: I mean the — the prominence it’s getting is — is — privacy doesn’t – shouldn’t totally disappear. CROWLEY: Senator, let me move you on to the — do you have a single big question about what went on in Benghazi or what happened in the aftermath that you think must be answered? KYL: I have three questions that have to be answered. Why weren’t the warnings about the need for security heeded? Why weren’t the requests for help during the terrorist attack answered? And why did the administration think it had to cover up all of the things that occurred before by putting out to the American people a narrative that I think will turn out to be absolutely false? CROWLEY: Congressman, do you have the same? FRANK: — first of all, I — I do think this. I’ve been, you know, shortly after I got into Congress, 280 Marines were killed in Lebanon on Ronald Reagan’s watch. And he said, well, when you’re fixing up the house, they — there were delays in the construction. Bad people do terrible things to Americans. I don’t like it when that becomes a source of political dispute. And I had nothing critical to say about the Reagan administration or — and — and these things will happen. You know, our — Americans are exposed all over the world because we have decided to be proactive in that way. And it’s hard to protect everything. Given that, yes, I would like to look into it. But as to the narrative, if you’re just talking about saying it was a terrorist attack, I’m pretty sure (INAUDIBLE). I mean saying it was — that — that — that — that movie. So I — I don’t think that there was a prolonged attempt there. And there is something called the fog of war, the confusion. Uh, but I — I — yes, I would like us to know what happened so that we can maybe take better, uh, account, if any, in the future. LIEBERMAN: To me, there — there are three different kinds of questions about Benghazi — what — what happened before the attack, what happened during the attack and — and what was said and decided after the attack. The most important one, to me, is our Homeland Security Committee begins its own inquiry into this, is what happened before the attack? The painful question is, why didn’t we provide more security for our mission in Benghazi? And if we couldn’t do it, maybe we should have closed the mission and taken the people to Tripoli, where they were more safe. The — the other thing I think we’re — we’re going to focus on as this goes on is — I believe that the Defense Department, for instance, tried immediately to get help, uh, to our personnel on the ground in Benghazi. But — but help was far away. And it raises a question about whether the African Command of the U.S. military ought to have more assets and personnel nearby on the ground. The third part about what happened afterward is, obviously, of — of real concern. I think, particularly in fairness to Ambassador Rice, there ought to be the widest public airing of what led to her statements and others in the administration, particularly, obviously, if she’s going to be nominated, uh, for secretary of State or some other high office. CROWLEY: But that’s not an automatic, uh, no for you? LIEBERMAN: No, because — but first of all, I think she’s had a distinguished career up until now. But secondly, um, I don’t know — I don’t feel that I know exactly what, uh, she was told before she went on TV that, uh, Sunday morning. And I think we ought to find out before we decide on — on whether she’s a good or bad public servant. CROWLEY: Senator Kyl used the term cover-up, correct, in — in terms of like afterward, saying, well, this all had to do with this videotape and it had to do with this — there was a riot. It turns out it had nothing — there was no riot and it wasn’t about the videotape, that was going on in Cairo. Do you worry that there have been a cover-up? HUTCHISON: I am very concerned about the — the fact that on September 11th, this happened, and on September 20th, the Senate was given a classified briefing and they were still the — the top level people were still telling us the same thing. They were telling us things that they knew — that we even saw in the press were not, uh, correct information. , Benghazi was a consulate, it wasn’t a full embassy. And I think if we have learned one thing, it is that maybe we should close consulates and — and give the full protection to our ambassadors who are willing to risk this kind of upheaval. Um, so I do think we need to go into this in-depth. I think if — if — if there were military people trying to get in and they were being told no, no, no, repeatedly, we need to fix that. FRANK: Oh, I thought you meant the voters who sent us here. CROWLEY: No. No. The voters, yes. The voters who sent you often ask me, why can’t they get anything done? And my question to you is, does it seem worse to you now? And what do you consider the good old days? Like what were the good old days for you? KYL: — Congress to get things accomplished now. FRANK: — two good old days. 2007 and 2008, because I don’t agree with this equal right. And, again, tell the voters, if you didn’t like these people, why did you vote for them? And I’m serious. This effort to analyze this out of the context of the democracy, part of the problem I agree with John about the way our media is now configured, the most activist elements in our society, on the left and on the right, live in parallel echo chambers. They only listen to and hear from people who agree with them, whether it’s on the Internet or on the talk radio. And so they don’t — they’re — they’re (INAUDIBLE). But I want to go back to this is not like bipartisanship never existed. In 2007, the Democrats took of the House and the Senate. And I will tell you, there was a great deal of cooperation with George Bush. I was part of it. Hank Paulson asked me to write the preface to his book about the — the — the crisis. Harry Reid and Nancy Pelosi worked with George Bush on a stimulus. And what happened then was, frankly, I think when Barack Obama got elected, he did not get, from the Republicans, the degree of cooperation we gave him. When Mitch McConnell said, my number one agenda item is to defeat this president. Harry Reid didn’t say that when George Bush came to him and said I have a stimulus. And I — so I don’t find this plague on both your houses appropriate. CROWLEY: — bitter times in there, as well. FRANK: But he also worked with him to get the stimulus, worked with them to pass the TARP when he asked us to, worked with them — that whole period of 2007 and 2008, uh, there was a great deal of cooperation on the areas that I’m familiar with. CROWLEY: Do you remember good old days? LIEBERMAN: I — I do remember good old days. Just to put it in a context, I’ll say when I arrived in 1989, from Connecticut, uh, where we had politics, I was surprised at how partisan, uh, Congress was. I saw it in some foreign policy questions, which I didn’t expect to find it. And I’d say over the years, Congress has become more partisan. The last two years probably the most partisan and the least, uh productive. But throughout all that, a — a lot of great moments. I mean in the first, uh — uh President Bush 41, a remarkable experience where he and — and George Mitchell, the Democratic majority leader, convened a group. We worked for weeks, passed amendments to the Clean Air Act, we can have really not only cleaned up the air, but enabled people, uh, to live longer. a lot was done under President Clinton. Welfare reform, an anti-crime bill, and — and most significantly, when we look back, the balanced budget amendment. And the same was true during the Bush years. Very blue — very partisan conflict and yet No Child Left Behind passed and although a lot of people who voted for it somehow forgot they voted for it, the — the Bush administration’s first round of response to the — to the fiscal collapse — was broadly supported because it was absolutely necessary. FRANK: More by Democrats than the Republicans. LIEBERMAN: More by Democrats than the Republicans, but In my opinion, the last two years, 2011-12, have been the least productive and most partisan and uncompromising in my 24 years here. The public seemed outraged at the status quo. That produced so little. And yet what results from the election? LIEBERMAN: — a Democratic president, a Democratic Senate, Republican House. So I mean if anything is going to get done, uh, we’ve got to change our behavior. And I think the president really is the authority now to set the tone and cajole, convince, charm, occasionally coerce people from both parties to sit down at the table and work out our problems. CROWLEY: When you see that Congress’ approval rating is at 12 percent or 10 percent or the lowest it’s ever been or whatever it happens to be, is that kind of hurtful to you all? Do you look and say, wait a second, I’m up here beating my head against the wall, trying to get stuff done? How do you take that? HUTCHISON: Well, it’s not a personal hurt, because I — I feel like, uh, I — I know I’m doing a good job and I know my constituents know it. Uh, it is a disappointment that people would, um, say that in a poll, because they’re mad about something. And I agree with you, in that I think people do like, individually, the people they’re electing. But they don’t like what they see in the whole, which is gridlock. But that, again, is because America is also gridlocked. FRANK: I mean, people themselves are eternally gridlocked. Um, we hear from people cut the deficit, expand Medicare. We get a very inconsistent set of — of messages from them. So, no, I don’t feel guilty at all and I don’t feel badly. But I think — I — I find there’s a great commitment to solving the problems, but when we get to the specifics, I was in city hall in Boston 44 years ago complaining about people who wanted a swimming pool in a neighborhood and then complaining because the dump trucks were coming in and out, digging out the swimming pool. It was bothering them. And I complained to an old city councilor, Freddy Vangone. He said, hey, kid, ain’t you heard the news, everybody wants to go to heaven, but nobody wants to die? I think that’s what I get from too many of the constituents. They want us to cut the deficit, but don’t raise my taxes and don’t cut this and don’t cut that and expand this and expand that. We do our best and I — I’m not troubled by — by our inability to do what some of them want us to do, which is impossible. KYL: I’m a little troubled, sometimes, by, uh, the thoughtlessness of some people who are quick to criticize anybody without differentiating between those who are trying to — to do their best. But it’s hard to argue with the American people, generally, when they look to Washington and see the, you know, the mess that we’re in right now. It is all so true, as everyone here has said, that to some extent, that reflects the will of the American people. We want it both ways. But we work for the American people. And they’re not devoting their whole lives to solving these problems, as we are. We’re supposed to be better than we are. To that extent, they have a good point. LIEBERMAN: You know, it — it’s an American tradition, and a healthy one, to not think too well of Congress. But the — the — the public attitude toward Congress in the last couple of years has really been historically low. And that does make me feel bad, because I — I think the public is right to have an unfavorable view of what’s happening here, because we’re not getting our work done. We’re not getting the work done that they sent us here to do. What — what’s fascinating about this recent national election is that it looked like, uh, for the first time, at least in a long time, the public would not only be unhappy with Congress as an institution, but would actually take it out on — on their senators and representatives. And by and large, that didn’t happen. Incumbents were reelected. So, uh, the distinction that Kay has cited is still true and maybe it just speaks to the, uh, ambivalence at a personal level, of most of the people. But I tell you, I hope after the next two years, uh, that more people than 9 or 10 percent will have a favorable view of the United States Congress. FRANK: And we’ll be watching them to make sure they do it right. CROWLEY: Let me try to do, in our final moments here, some superlatives — I wanted to see if I could get you to recall your best day out here. KYL: A lot of good days and a lot of days that weren’t so good. The most memorable day was September 11th, 2001 and several days thereafter. Those are days seared in my memory and everyone else who was up here. Very close to the room that we’re in right now is where I had to, uh, hang out during the anthrax scare, uh, up here, where, uh, we all had to move out of our offices in the Hart Building and locate in a little cubby hole in the Capitol. Um, those aren’t good memories, but, uh, nevertheless, they were important events in our history. FRANK: Well, I’ll give you the best. For me — and I’m grateful to Joe for his work, it was after all these years when we repealed in the lame duck session in 2010, “don’t ask, don’t tell,” when a terribly unfair, libelous judgment on me and millions of people like me was abolished. And I think it’s worked out well. I worked hard on that. Joe was working hard on it in the Senate. Um, the day that passed in the House was a — was a very good day for me. LIEBERMAN: Well, interesting I — I’ve been saying to people before the U.S., that probably the most thrilling moment I had was when “don’t ask, don’t tell” got repealed. Now, I had the privilege to do a bunch of other things. Maybe the most satisfying accomplishment was after the 9/11 legislation, which I had the privilege to manage in the Senate, passed and we were formed. We created the Department of Homeland Security and reformed the intelligence community. HUTCHISON: Well, the excitement of winning something that you fought for, I think, is what you’re hearing. And mine is that I thought that we were going to lose our American focus on space exploration, manned space exploration. And, uh, I teamed up Senator Bill Nelson from Florida, and we crafted a compromise that allowed commercial crew vehicles to go forward, but not at the expense of the next generation of space flight. And you saw an excitement in space for the first time in years when that Rover landed on Mars at precisely the place it was supposed to land, after being in the air for six months. And I thought, yes, we — we’ve done something that is really important in the big sense. CROWLEY: What will you most miss? Let’s — let’s say you like many of our colleagues and you’ll miss them. But what — what about this place will you miss? FRANK: The chance to affect public policy in ways that are really important to me. That’s the reason I do this. I think that’s the reason all of us do it. I will say I think the public vastly underestimates the legitimacy of the motives of the people who are here. FRANK: The — the major motivating factor is what we think is right. I have some strong views about how to make this a country which is both fairer and at the same time, productive for its citizens. And I will miss the chance to wake up and hear something on the news and say, Geez, I’ve got to do something about that. KYL: Precisely the same. I mean that’s why most people are here, liberal, conservative. We’re here for the same basic reason. And, a — one of the things that I’ll — well, the thing I’ll miss the most is having to walk away from a position to have the kind of influence that you have in the United States Congress on things that — that mean a lot to you. HUTCHISON: It is. It’s effectiveness in the macro sense. When I was a practicing lawyer, after I had served in the state legislature for several years, and I was negotiating on whether a comma went in this place or that place. And I thought, you know, I’d rather be talking about mass transit. I’d rather be doing something that I thought would have a big impact and make a difference. And it is why we’re here and it is what we’ll miss, because I’m going to go back to doing commas and paraphrase and, uh, it won’t be the same. But, I also love the people so much. I mean I love my colleagues. I — I love the camaraderie. There is a sense, uh, that we understand the pressure that we have, our constituents, the outside groups, the — the time management, uh, pressures. And having other people with the same, um, circumstances is — it’s fun and it’s in — it’s invigorating. LIEBERMAN: Well, uh, I’m very similar. You know, there’s a lot of good friendships here, so just allow for that. But it’s part of what I’ll miss. Um, the other part is to see a problem, um, think about how you can help to make it better, submit the legislation, and usually finding a co-sponsor from the other party, because that’s the only way we get anything passed here. And then working it through the process and actually getting it done. That’s a thrill. But I — I’ve got to tell you, bottom line, 24 years here, I’ve been — I — I’ve been blessed with an opportunity. It — it’s time to move on. Will there be times next year, when something is happening and I’ll kind of wish I was still here and I could go out and speak on the floor or introduce legislation? Sure. But you know what? It’s time for me to move on to another chapter and it’s time for somebody else to have the privilege of being senator from Connecticut. FRANK: And some of the most satisfying things are to get people to — I mean, as Harry Truman said, being president meant getting people to do what they would have done in the first place if they had the brains to do it. KYL: Having more time to go chop wood up in my cabin. CROWLEY: Are you going to go chop wood up at his cabin? What are you most looking forward to? FRANK: Well, I’m looking forward to spending time with Jim. I got married kind of late in life and it’s something I plan to work at, uh, full-time. HUTCHISON: I’m looking forward to controlling my own schedule and being able to say I’m coming home on Friday and know, I’m really coming home on Friday. 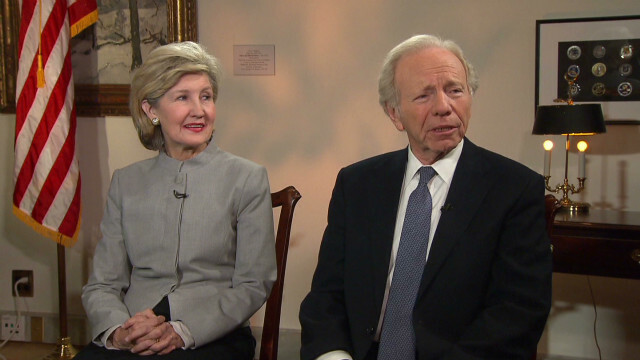 LIEBERMAN: I’m looking forward — if I can say two things — to doing something different. I mean change is — is very healthy in life. (START TAPE): “There are some people who call Al Gore’s selection of me a lot of chutzpah.” (END TAPE) And to spending a little more time with my family. CROWLEY: Senator Lieberman, Senator Hutchison, Congressman Frank, Senator Kyl, thank you all so much. Adieu, for now, you know, but we’ll see you soon. FRANK: Oh, is this when everybody claps for us? CROWLEY: This — now you all may clap.